As the holidays approach, those of us who enjoy hosting can start getting a bit party-crazy. We want to throw the best, most unforgettable holiday party around, but it’s very easy to get carried away without a budget. If you are still having flashbacks of the bills from last year’s party, you may be feeling nervous about what’s to come. Not to worry - there are plenty of easy ways to throw a great Christmas party without breaking the bank. Choosing the decor is often the most difficult step. When in doubt, go for a traditional feel. Focusing on traditional decor means that you can invest a bit more money in nicer, high-quality decor items, because you are likely to use them time and time again. Just make sure to stick to one palette. You can go classic red and green, frosty white and silver, rich gold and black, or a variety of other festive color schemes. For the tree, you can’t go wrong with Christmas ball ornaments. They’re classic, simple, and come in a variety of colors. Plant decorations like are always a lovely touch, and you can go beyond the traditional holly, mistletoe, and poinsettia: Better Homes and Gardens has some great suggestions for non-cliche festive flowers. It may be tempting to take your party high-end, with expensive caterers and flutes of champagne, but you can still be classy without spending a fortune. This list by Real Simple has some wonderful ideas for a top-notch spread without the big catering bill. For example, focus on one well-made signature cocktail instead of an open bar. To keep things cheaper and stress-free, make a large punch bowl instead of a complex drink with rare ingredients. Another much cheaper option is the classic potluck. This works especially well if you are bringing together close friends who won’t mind chipping in, but it can also be a way of bonding with neighbors or co-workers. Make sure to look up some great potluck recipes so your contribution is appropriately show-stopping. The more the merrier, especially around the holiday season. However, you need to consider whether it’s a case of “the more guests, the more stress and money this party is going to cost me.” It’s important to put a bit of thought into who you actually want at the party. Things you need to consider include size, budget, and group dynamics, with the latter being particularly important. The numbers will also depend on what your goal for the evening is. Do you want an intimate night to celebrate the holiday with your loved ones? Limit the guest list to close family and friends. Do you want to get to know your neighbors? Invite them all, but keep your actual acquaintances to a minimum. Tell people they can bring partners, but have them check with you before bringing friends or general acquaintances. It’s up to you to make the call on whether children are allowed, but bear in mind that for many people, having to get a babysitter can be a barrier to going out. The last thing you can do to keep your budget down is just....relax. A holiday party doesn’t have to be a stressful, high-stakes affair. The more pressure you put on yourself for everything to be picture-perfect, the more you’re going to end up spending on details your guests may not even notice. 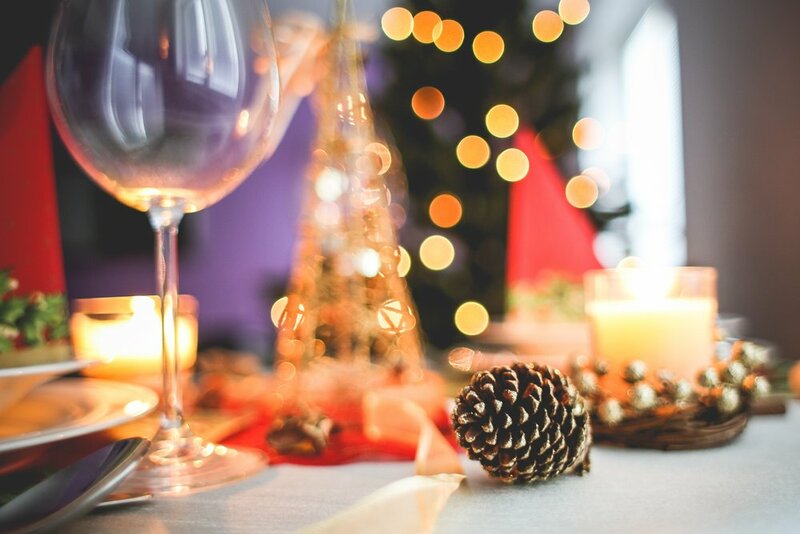 What they will notice are the small touches that allow them to have a nice time together to celebrate the holiday season, like a good holiday playlist, a warm welcome, and a happy, relaxed host.